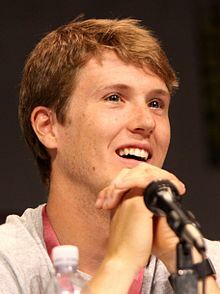 Spencer Treat Clark (born September 24, 1987) is an American actor who has appeared in several films, including Gladiator, Mystic River, Unbreakable, and Glass. Clark was born in New York. He is the brother of screenwriter and playwright Eliza Clark. He was educated in Darien, Connecticut, at Hindley Elementary School, Middlesex Middle School and his freshman year at Darien High School before he attended and graduated from The Taft School in Watertown, Connecticut. Clark graduated from Columbia University in New York City, receiving bachelor's degree in political science and economics. Clark began his career in 1995, appearing on the television show Another World. His film debut was in Arlington Road. He appeared in the series finale of Mad Men and in the 2014 film Cymbeline. As of 2019[update], Clark has a recurring role on the television series Animal Kingdom. Clark resides in Los Angeles. 2003 Mystic River Ray "Silent Ray" Harris Jr.
1999 Third Watch Kyle Episode: "Impulse"
2004 Law & Order: Special Victims Unit Brian Coyle Episode: "Families"
2009 The Good Wife Kenny Chatham Episode: "Home"
2011 Law & Order: Special Victims Unit Greg Engels Episode: "Spectacle"
2011 The Closer Jesse Dixon Episode: "Repeat Offender"
2015 Mad Men Kelly Episode: "Person to Person"
2017 NCIS Ryan Episode: "Keep Going"
2018 Criminal Minds Jordan Episode: "Ashley"
2019 Chilling Adventures of Sabrina Jerathmiel Episode: "Chapter Seventeen: The Missionaries"
^ a b "Everybody's Talking About Spencer Treat Clark". The Guardian. December 30, 2000. Retrieved March 4, 2018.